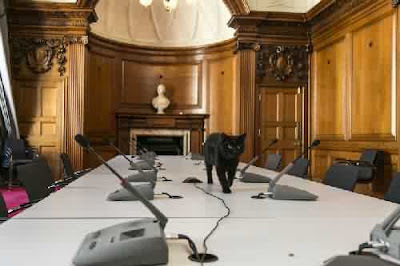 "Gladstone can look forward to poring over budget scorecards, greeting visitors from around the world, but most importantly, setting his sights on the rodent population of the Treasury and assisting our pest controllers in keeping down the number of mice in our Horse Guard Road offices." The sometimes quarrelsome duo now have been joined by yet still another moggy in the form of an eighteen-month-old, black domestic shorthair named Gladstone who arrived at the Exchequer on June 27th. The decision to bring him on board was made by the department's John Oliver Frank Kingman who since that momentous undertaking has left public service in order to return to the private sector. It also is conceivable that he may have played a role in the naming the Treasury's newest arrival in that while he was Foreign Secretary he supplied Palmerston with his moniker. The similarity in the the two cats' names could not possibly have been a coincidence in that whereas the Foreign Office's resident feline was named in honor of Viscount Palmerston III, who twice served as prime minister during the nineteenth century, the Exchequer's new cat is named in honor of William Ewart Gladstone who later followed in Palmerston's footsteps by serving as prime minister for no less than four times between 1868 and 1894. The political rivals often were at loggerheads and for that reason, among others, it is going to be interesting to see how well that the two toms get along with each other. 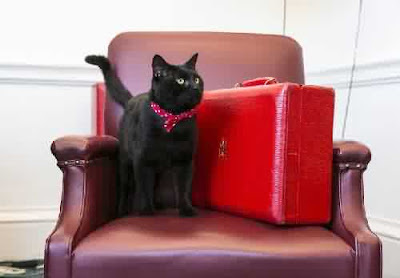 So far, however, it has been all smooth sailing for Gladstone, even if the name bestowed upon him is more properly suited for a cat employed by Her Majesty's Diplomatic Service as opposed to one who is engaged in the vagaries of high finance. Be that as it may, Gladstone is certainly a far more dignified name for a cat than either Adam Smith or Barclays ever would have been. 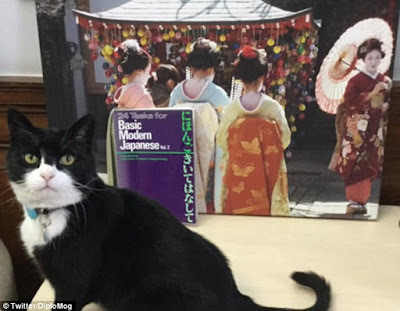 Much more pertinently, no self-respecting feline ever has given so much as a tuppence for all the moola in Her Majesty's Treasury; a school of tuna, however, would be an entirely different proposition. 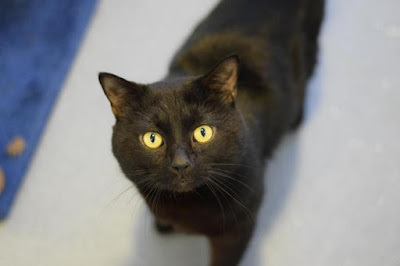 "We are delighted to introduce our new cat, Gladstone, to the heart of British politics," a spokesperson for the Exchequer is quoted as declaring in a July 29th press release issued by the Battersea Dogs and Cats Home in south London. 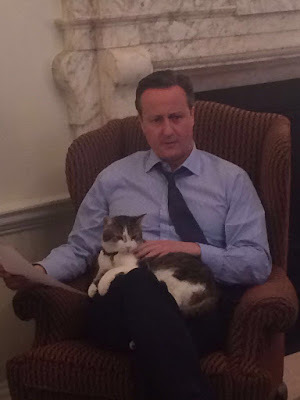 (See "Westminster Welcomes Its Third Battersea Mouser.") "We are confident that Gladstone will live up to the legacy of his namesake... and go down in history as one of the most impressive cats to roam Whitehall." In that regard he certainly has his work cut out for him in that preliminary indications are that the slave drivers at the Exchequer plan on working him damn near to death. 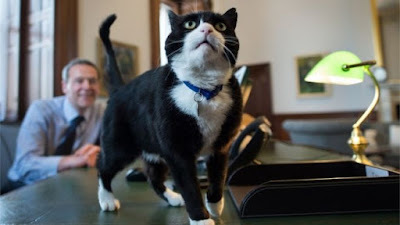 "Gladstone can look forward to poring over budget scorecards, greeting visitors from around the world, but most importantly, setting his sights on the rodent population of the Treasury and assisting our pest controllers in keeping down the number of mice in our Horse Guard Road offices," the spokesperson continued. Battersea, which previously had unloaded both Larry and Palmerston on the politicians, echoed those sentiments. "He's a confident cat who absolutely loves people so he'll have to tear himself away from his cat cuddles to get down to business becoming a marvelous mouser," the organization's Lindsay Quinlan said in the press release cited supra. "Staff at Battersea fell in love with Gladstone during his stay here, his big cheeks and big heart match his big personality and we think the staff at the Treasury will quickly fall for his charm too." 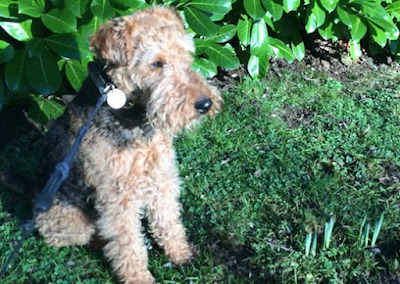 During his first few weeks at the Exchequer Gladstone, who sports an attractive red ribbon around his neck, was confined to an office with six bean counters. During that period, he bided his time by playing in Hammond's Red Box (used for transporting official documents), scampering across tables, desks, and computers, chasing flies, staring longingly out the window and, of course, resting up before tackling the long laundry list of chores that have been assigned to him. By this time, however, he should have been fitted with an electronic tracking device and turned loose to patrol the sprawling grounds of the Treasury. In the precious few snatches of free time that has been left to him, Gladstone has turned to Twitter and Instagram for his amusement as well as to keep in touch with his ever-growing legion of fans. Other than that, almost nothing has been disclosed about his personal care and living arrangement. The only thing known for certain is that he will not be bunking with Hammond and his family at 11 Downing Street as Sybil did with Darling and his wife during her tenure at the Exchequer. A facilities and security team will, supposedly, look after his needs on weekends with Treasury staffers doing likewise on the days that they turn up for work. Conspicuously omitted from all the hoopla generated by his unexpected arrival upon the political scene has been any mention whatsoever of exactly where he is going to hang his hat and that in turn has led to speculation that he very well could wind up sleeping out in the elements like Palmerston. His personal safety is an even greater concern but, as best it could be determined, no one at the Treasury has been assigned the herculean task of making doubly sure that he is neither run down by a motorist nor meets with foul play. That entire arrangement is so shameful that it borders on being criminal. If the Exchequer insists upon keeping a cat, a far more humane arrangement would be for it to invest a few taxpayer crowns in providing Gladstone with a warm, secure, and dry permanent place to live instead of forcing him to rely upon handouts from staffers for his daily sustenance. It also ought to appoint a paid guardian to attend to his needs and personal safety. Any individual or group who not only would condemn a cat to live out in the cold but to callously turn him loose to roam the perilous, traffic-clogged streets of Westminster richly deserves to be arrested, charged with animal cruelty, and then jailed for a long time. The petit fait that it is precisely politicians and bureaucrats who are engaging in such reprehensible and inexcusable behavior only serves to make it all the more contemptible. If accurate, that certainly would explain why he has so adamantly refused to both take personal responsibility for Gladstone's care and to allow him to live with him at 11 Downing Street. Predictably, the uncaring and totally irresponsible feline exploiters at Battersea have so far not had a blessed thing to say regarding this potentially ominous development. As soon as Rex either chews up one of the cats or chases one of them out into the street and to his death underneath the wheels of a motorist there most assuredly is going to be an international backlash against both Hammond and Battersea. Cruelty, neglect, and the naked exploitation of cats on any level only leads to more of the same on other levels and in that regard it is long overdue that the politicians and bureaucrats of Whitehall and phony-baloney rescue groups such as Battersea were held legally accountable under the anti-cruelty statutes. Contrary to what the Fleet Street crowd earnestly believes, this is not any joking matter; rather it is an issue of life and death as far as Gladstone, Larry, and Palmerston are concerned. Moreover, their precious lives are most assuredly not worth any less than those of the Hammonds and the representatives of the Batterseas of this world; au fait, those of the former are a million times more valuable than those of the latter. Gladstone's predicament is made all the more deplorable in that he, like Larry and Palmerston before him, has had a rough life. In particular, he was found back in May wandering the streets of London where almost anything terrible can, and usually does, befall homeless felines. Even more outrageously, his previous caretaker made absolutely no effort whatsoever to reclaim him after he, originally known as Timmy, had skyrocketed to international fame with his appointment to the Treasury. There is not any way of knowing for sure, but that certainly makes it appear that he was intentionally abandoned to either sink or swim on his own. Gladstone is most definitely anything but a "greedy" cat; au contraire, his seemingly insatiable appetite is merely a leftover side effect from the time that he spent starving on the street. Once he becomes accustomed to receiving regular and timely meals his eating habits should return to pretty much normal. Provided that Hammond belatedly comes to his senses and does not proceed with his outrageous plan to install Rex at 11 Downing Street, Gladstone should be able to look forward to, hopefully, many happy years at the Exchequer. There also is not any obvious reason why that he should not be able to get along famously with Larry and Palmerston. There may be a few spats here and there along the way but that is only normal where cats are concerned. Nevertheless, the interactions between all three toms need to be closely monitored in order to ensure that none of them gets seriously injured. 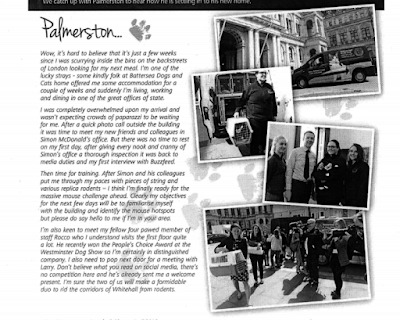 Photos: Battersea Dogs and Cats Home (Gladstone with Hammond's Red Box and on top of a table), Your Local Guardian of Sutton in Surrey (Gladstone up close), and Twitter (Rex). "Larry is staying. 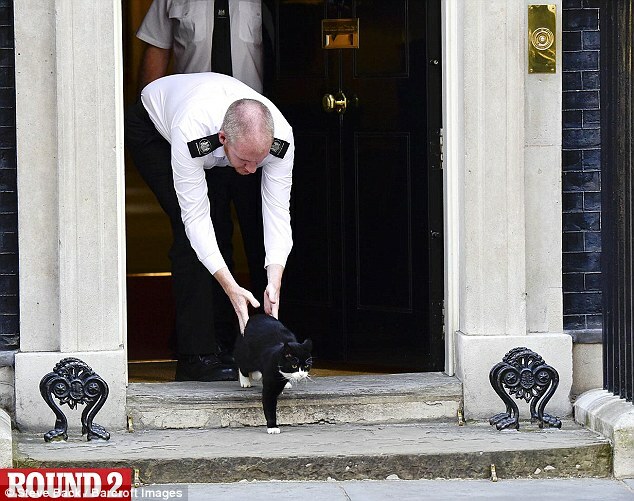 He's very much the Downing Street cat, not the Camerons' personal cat. He is a Downing Street legend." 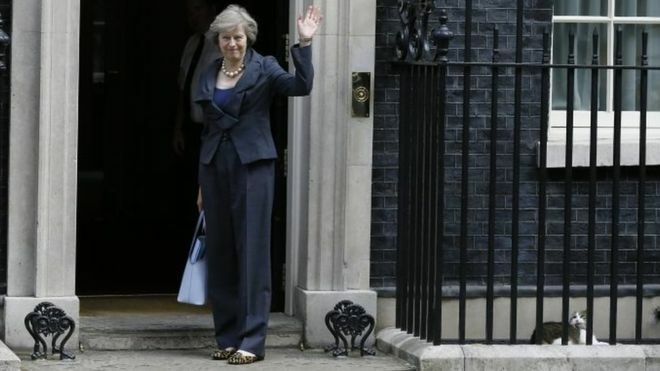 The momentous decision of the English people to bid a not so fond farewell to the European Union in a June 23rd national referendum sent shock waves throughout not only Whitehall but the world as well and that in turn culminated in the departure of Prime Minister David Cameron on July 13th. 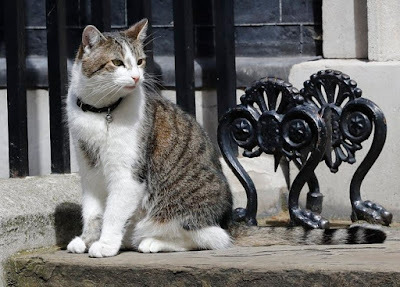 Numerous other heads rolled throughout the political establishment but once the dust had settled the most unlikely survivor of all turned out to be the prime minister's much maligned nine-year-old brown and white resident feline, Larry. "Larry is staying. 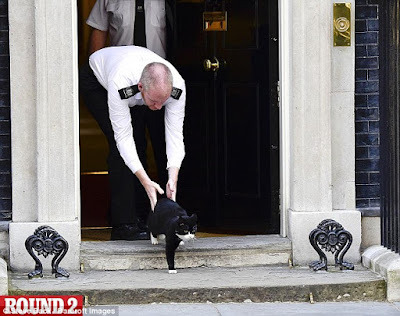 He's very much the Downing Street cat, not the Camerons' personal cat," a spokesman for the Cabinet Office told the print edition of The Philadelphia Inquirer on July 13th. (See "Larry Stays at 10 Downing.") "He is a Downing Street legend." As nonsensical as both Cameron's and the Cabinet Office's reasoning appear to be au premier coup d'oeil, it is not without some small measure of precedent. 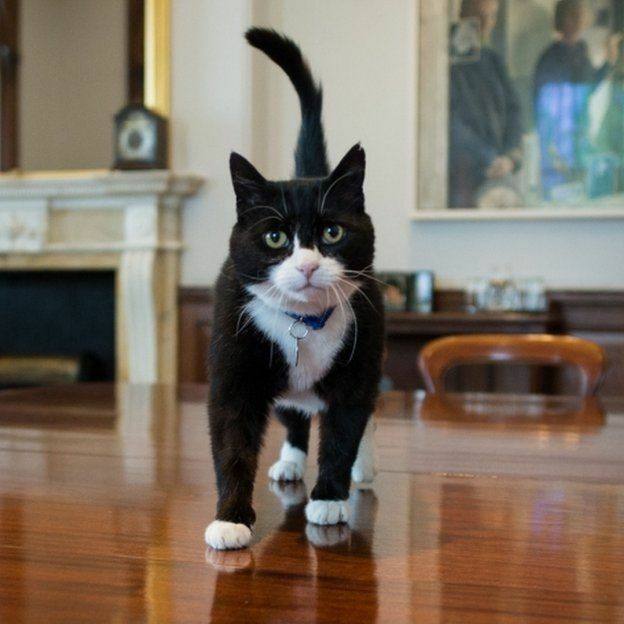 For instance, when Humphrey wandered into 10 Downing Street back in 1989 he was allowed to remain there throughout the tenures of both Margaret Thatcher and John Major but neither of them was willing to provide him with a permanent home after their political careers went up in smoke. The similarity in the treatment meted out to him and Larry ends there however because once the old snake charmer Tony Blair and his resident witch, Cherie, had gained control of the levers of powers in 1997 all the benevolence lavished upon Humphrey by both 10 Downing Street and the Cabinet Office went out the window much like a baby with the bath water. Almost as appallingly, there was not any hue and cry of protest to be heard anywhere on Whitehall concerning either the fact that the prime minister's residence was, most likely, the only home that he ever had known or his right to have lived out his remaining days there. As utterly reprehensible as all of that was, Humphrey is far from being the only cat to have been hideously used, abused, and then discarded like yesterday's newspapers by the politicians and bureaucrats who attempt to boss around the world from the comfort of their palatial residences on Whitehall. For example, in early 2008 cat and animal hater Gordon Brown ordered Chancellor of the Exchequer Alistair Darling to get rid of his cat, Sybil, who earlier had been brought down from Edinburgh. The deafening silence of the Cabinet Office in regard to the ousters of both Sybil and Freya can perhaps be explained by the fact that both of them, unlike Larry, were privately owned felines. That does not account in any way, however, for its acquiescence in the Blairs' machinations against Humphrey. When all is said and done, the distinction that both Cameron and the Cabinet Office is making between privately owner and governmental cats appears to be more contrived than real. It does furnish, however, a rather convenient rationale for allowing both politicians and bureaucrats to shirk their solemn responsibilities to them. More broadly speaking, the thinking and behavior of Cameron, Darling, and Osborne is radically at adds with that of all genuine fans of the species who never under any conceivable circumstances would even so much as countenance the very thought of abandoning their beloved companions. In his defense, Cameron insisted to the bitter end that he cares deeply for Larry. "(I want to end speculation that) I somehow don't love Larry," he told the Daily Mail in the article cited supra. "I do, and I have photographic evidence to prove it." The proof of his affection consisted, however, of only a single photograph of Larry sitting in his lap. Besides the rather obvious possibility that the photograph could have been staged for propaganda purposes, one tender moment spent with a cat does not prove fidelity any more than the cameo appearance of a solitary robin is a harbinger that spring is just around the corner. Once he had come to power, however, he and his cronies immediately recognized the public relations bonanza to be reaped by bringing on board a resident feline and as a result the then four-year-old Larry was adopted by 10 Downing Street on February 16, 2011. "I'm sure he will be a great addition to Downing Street and will charm our many visitors," Cameron proclaimed upon his arrival. Despite the unassailable fact that Larry's acquisition had been motivated by the basest of political motives imaginable, both Cameron and the media insisted upon perpetuating the myth that he had been brought in to catch mice. That was a ruse that the sniveling buttlickers at the Battersea Dogs and Cats Home in south London, who earlier in January of 2011 had arrested him in the street and unjustly incarcerated him, were only too happy to go along with for, quite naturally, a price. "Larry should not have any problem getting the mice under control," the organization's Kristy Walker ballyhooed at that time. "I can definitely see Larry holding his own." As things eventually turned out, the rodent infestation allegedly plaguing 10 Downing Street turned out to be the least of Larry's worries in that no sooner had he set his paws inside the premises than the back-stabbing, character assassinations, and general disparagement commenced with a vengeance foreign to even Whitehall standards. 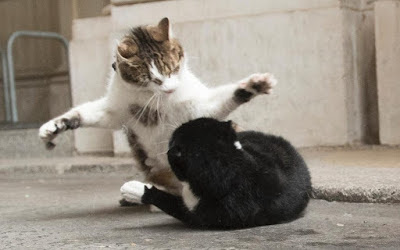 The trouble all began when ITV reporter Lucy Manning made a stink about being scratched after she idiotically had forcibly attempted to get Larry to pose for her. Soon thereafter a peeler posted outside the world's most famous black door was photographed abusing Larry with his foot. That was quickly followed up by a seemingly never-ending stream of press reports calling into question his prowess as a mouser. It even was feared for a while that he was about to be sacked. Thankfully, that never occurred but life did not get all that much easier for him. There also were persistent complaints from staffers who had been scratched when they sat down on top of him. Being quite obviously either blind or every bit as mindless at Manning, they only got what they richly deserved but being totally unwilling to acknowledge their own faux pas they lamely attempted to pack off all the blame on Larry who, unfortunately, is unable to speak up in his own defense. He later on was reportedly banned from the Camerons' refurbished flat following a £64,000 makeover because he allegedly was leaving cat hairs all over the place. "Poor Larry is being treated like some servant from Downton Abbey," Labor MP Kerry McCarthy of Bristol East complained in 2011. "It is shocking that after all the publicity he is not even allowed to set paw inside the prime minister's flat." The only thing that can be said for certain is that the aftermath of the Brexit vote is destined to consume a lion's share of her time and energies well into the foreseeable future and that could prove to be either a good thing or an ominous development as far as Larry is concerned. 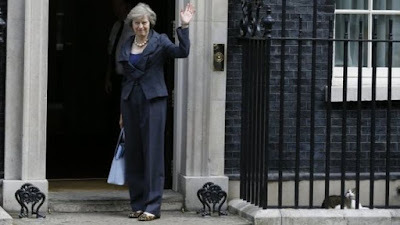 Most disquieting of all, the English media has been uncharacteristically reticent when it comes to May's views on Larry in particular and cats in general. 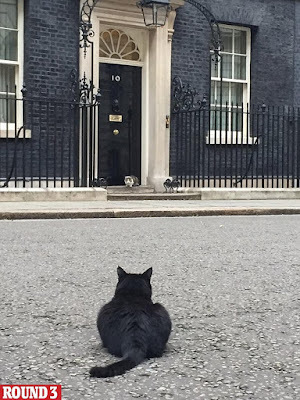 Only time will tell how well that he is able to get on with the new tenants of Number 10 but if the nine-year-old moggy has demonstrated anything during his time spent in the political spotlight it is that he is a survivor. Hopefully, May will have the bon sens to realize that he is, arguably, the number one asset that she has going for her in the turbulent and uncertain days and years that lie ahead. Although Larry in all likelihood is provided with an adequate supply of food and water, shelter, and access to veterinary care whenever he needs it, the proper care of a cat entails considerably more than those basics. Of particular concern in his case is his personal safety in that Whitehall, like virtually everywhere else nowadays, has its fair share of cat-murdering motorists, poisoners, thieves, and other assorted ailurophobes. In that light, it is especially disturbing that, as far as it has been revealed, the Cabinet Office does not assign any particular individual the daunting task of looking out for his personal safety. Consequently, he is left to wander the perilous streets of Whitehall both night and day without the benefit of a chaperone and that can only be a prescription for disaster, if not death itself. No matter how that his living arrangement is analyzed, it is impossible to come away with any other conclusion than that a gaggle of uncaring bureaucrats with their own political axes to grind are poor substitutes for a loving and conscientious guardian. Then there is the troubling question of what is going to happen to him once he has outlived his usefulness to both the Cabinet Office and the occupants du jour of 10 Downing Street. In addition to the naked exploitation of cats like Larry by the politicians and bureaucrats of Whitehall as well as the media, the conduct of Battersea in this shabby business is simply abominable. Whereas any legitimate rescue group would put the needs, safety, and happiness of its cats first, it is only concerned with feathering its own nest by currying favor with the political elites. Tant pis, absolutely no one involved in the least little way with Larry is willing to even acknowledge that sacred responsibilities accompany all forms of cat ownership. In addition to that, everyone involved is setting a simply disgraceful example of how a cat should be treated. 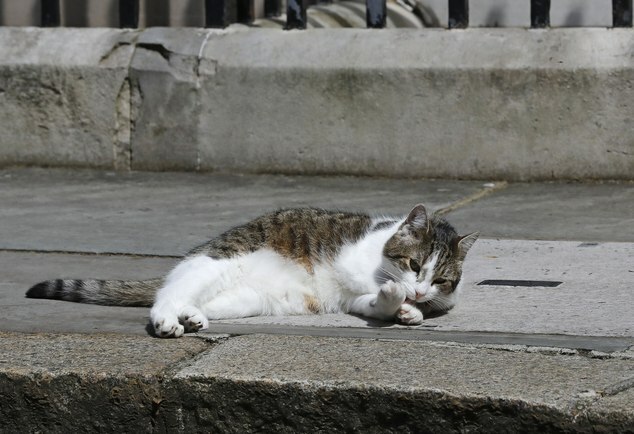 To put the matter succinctly, the politicians, bureaucrats, media and, above all, Battersea, either should face up to their responsibilities to cats like Larry or otherwise get out of the feline exploitation business once and for all time. That is not about to happen, however, because absolutely none of them are capable of even acknowledging that cats are morally sentient beings whose lives are worthy of being treasured and safeguarded; instead, they look down their disjointed schnozes at them as being little more than an endless supply of inexpensive political props to be exploited to the hilt and then afterwards to be gotten rid of in the quickest and most expeditious manner available. It therefore does not seem unfair to consign all of those rotten apples to the same barrel that is currently overflowing with those coarsest of all souls who know the cost of everything but the value of absolutely nothing. Even more lamentably, Larry's distinguished service on behalf of 10 Downing Street and the nation as a whole has been to this very day both largely underappreciated and in vain. Photos: Frank Augstein of the Associated Pres via the Daily Mail (Larry on the steps of 10 Downing Street and lying on the concrete), Twitter via The Telegraph (Larry and Cameron), and the BBC (Larry and May).